Phil Edgar delighted with the opening goal. Photo by IceHockeyMedia. Though making the trip to Dumfries without injured netminder Richie Lawson, long serving Warrior DJ Good and forwards Ryan Sample, Adam Perrie and Niall Ryder, Player-Coach David Longstaff had eighteen skaters at his disposal, not to mention shot stopper Jordan Boyle. Starting in spectacular style on Saturday evening, Whitley immediately proved problematic opposition for the Sharks as left winger Ben Campbell capitalised on a power play just twelve seconds after Solway’s Steven Moore was sinbinned for high sticks, the Warrior firing into the top left of Kyle Johnston’s net with support from Alternate Captain Sam Zajac and blue liner Harry Harley on 1:25. Motivated to double their lead, the Warriors were handed the perfect opportunity when Canadian Phil Edgar received the puck from defenceman Josh Maddock to dexterously select fellow forward Kyle Ross who drove into his offensive zone to score with a backhanded shot on 5:13. Exhilarated by their two-goal lead, Whitley were eager to enhance Solway’s deficit and did so less than two minutes later in spite of an interference penalty for former Shark Ross Connolly, this time Campbell collecting the puck on the blue line to snipe past Johnston on 7:08 after a slick pass from Harley and some neat play from forward Shaun Kippin. Calling a timeout, Sharks’ Head Coach Martin Grubb replaced netminder Johnston with Jordan McLaughlin. After resuming play, Canadian Cale Tanaka battled against Whitley’s defence and forward Scott Henderson also set his sights on goal. Remaining strong whilst Boyle pulled off some outstanding saves, the Warriors ensured they did not concede and instead looked to extend their lead, with chances arising for both Campbell and Ross to no avail. Meanwhile, a long range shot from Captain Struan Tonnar at the other end of the ice failed to surpass Whitley’s defence whilst ‘D’ man Liam Smedley threw himself in front of forward Rick Bentham’s attempt to keep Whitley’s 3-0 lead intact at the first interval. Picking up from where they left off, the Warriors added a fourth goal to their tally on 22:13 when Zajac skated around the back of McLaughlin’s net to find Longstaff who picked out Campbell, the left winger unleashing a one-timer to complete his hat-trick. Thirty nine seconds later, a holding sticks penalty for Captain Dean Holland reduced Whitley to four men but, after Tonnar’s shot went wide of Boyle’s post and Solway’s frantic efforts failed to make their mark, Campbell countered the Sharks’ power play in his quest for another breakaway goal. Just four minutes after Holland was reinstated, the captain ran into trouble again when he was sinbinned for charging. However, the shorthanded Warriors were given some reprieve when Ross was brought down by forward Scott Henderson on 30:05. Working the puck around their offensive zone, the Warriors made it 5-0 forty seconds later when forward Callum Watson tapped in Zajac’s long range shot with support from Harley. Though unwavering in their attacking play and defensive strength, Whitley incurred a bench minor for too many men in the final stages of the stanza but, again, the Sharks could not make the most of their power play, allowing the visitors to file in with a 5-0 lead at the end of the second period. Returning to the ice with confidence, the Warriors maintained their work ethic to frustrate the Sharks which showed when Solway’s Alternate Captain Ross Murray hooked forward Ross Douglass to earn himself two minutes in the sin bin on 44:38. Though eventually forced back into their defensive zone on their power play, the Warriors persevered to score less than two minutes after Murray returned to the ice, this time Edgar on hand to find the target assisted by Campbell and Douglass. Striving to chip away at Solway’s deficit, forward Joe Coulter seized an opportunity to fire from close range but his shot went wide of Boyle’s right post whilst Bentham tried his luck on more than one occasion without success. A late hit from Holland on 54:24 then saw the captain receive 2+2 for his actions before a bench minor for Whitley handed Solway a 5-on-3 power play. Just over a minute later, the Sharks capitalised with a superb blue line shot from defenceman Lewis Baldwin. After Whitley composed themselves with a timeout in the final two minutes of the contest, Baldwin incurred a penalty of 2+10 for a check from behind to allow the Warriors to complete their 6-1 win with a power play. Sheer delight from Whitley fans & players. Photo by IceHockeyMedia. 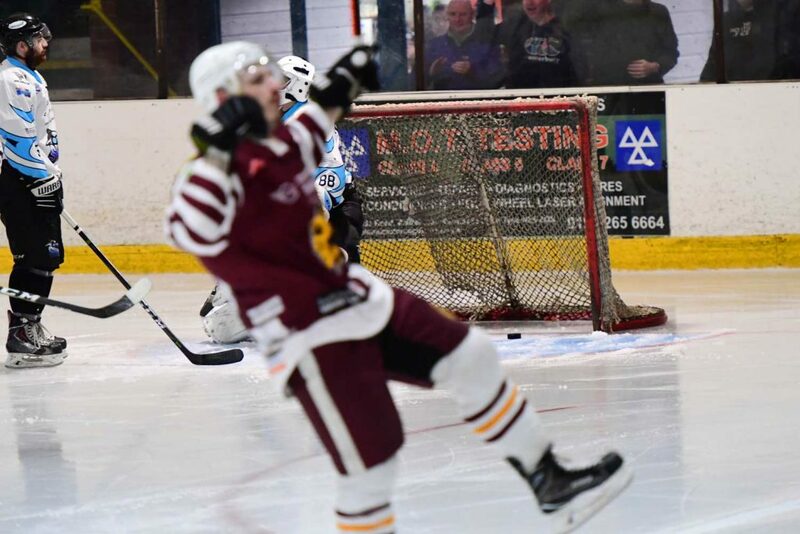 Taking to the ice for the home leg of their quarter-final with much the same team which faced Solway Sharks on Saturday evening, Whitley Warriors were on the ice for all of fifty five seconds when Captain Dean Holland was sinbinned for roughing. Remaining dangerous whilst shorthanded, the Warriors opened the scoring shortly after returning to full strength as determined Canadian Phil Edgar danced through Solway’s defence to flick the puck behind netminder Jordan McLaughlin on 3:10 courtesy of fellow forward Kyle Ross. Aware of Solway’s need to bounce back before Whitley gained a greater foothold, forward Rick Bentham fired home an unassisted effort to level the scoring on 7:26. Fifty seconds later, Canadian Cale Tanaka was sidelined for tripping but, after failing to make the most of their power play, Whitley’s stand-in defenceman Martin Crammond tried to make amends, his shot saved by McLaughlin before left winger Ben Campbell attempted a breakaway. Whilst working hard for possession in the corners, Captain Dean Holland struck Struan Tonnar’s discarded glove out of his path and incurred a misconduct penalty which allowed Shark Iain Bowie to present his team with a 2-1 lead on the power play. Soon after, Solway felt that they had achieved a third when the puck slipped dangerously close to the goal line with Boyle and his defence scrambling to keep Solway at bay. Retaliating, Campbell received a neat pass from Player-Coach David Longstaff in front of McLaughlin’s net but struggled to bury the puck. Ross then collected his rebounded shot after his initial attempt hit McLaughlin but he could not find the target, leaving the score line at 2-1 to the Sharks ahead of the second period. Jordan Barnes celebrates whilst Struan Tonnar looks on in despair. Photo by IceHockeyMedia. Whitley equalised just forty one seconds into the middle stanza when Alternate Captain Jordan Barnes nonchalantly meandered through Solway’s defence before rocketing a shot into the bottom left of McLaughlin’s net courtesy of Campbell. Scrappy play in Whitley’s defensive zone then led blue liner Liam Smedley to incur a tripping penalty on 21:43 which the Warriors killed, only to go shorthanded again when dealt a bench minor for too many men. Though unable to punish Whitley with their additional skater, the Sharks bagged a third goal when skilled forward Scott Henderson tapped in Bentham’s shot on 30:34. Seconds later, Solway thought they had the puck in the net for a fourth time when a shot pinged off Boyle’s post and beneath the netminder but the goal was eventually ruled out by officials after much deliberation. 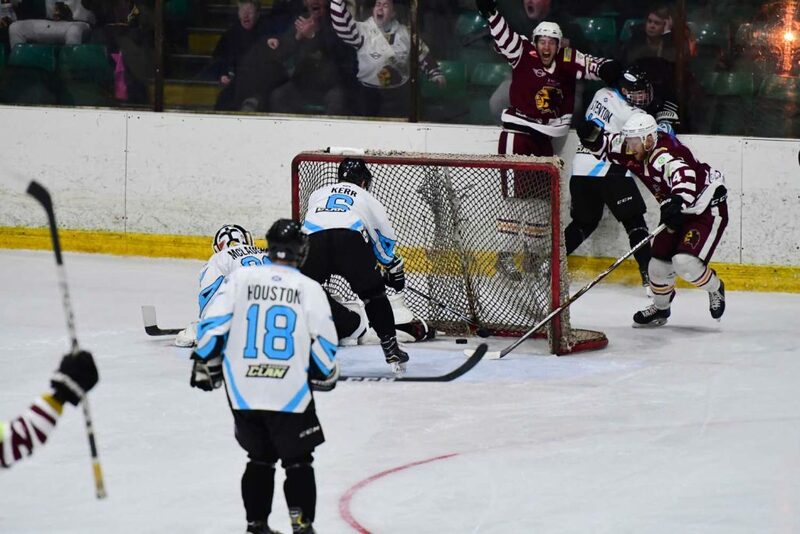 An offside call against the Sharks led to greater cause for concern for Solway when spirited Alternate Captain Ross Murray sustained an ankle injury which forced him out of the game. Undeterred, Tanaka slotted home to make it 4-2 on 31:09 to prompt a timeout from Whitley. Heading back onto the ice with confidence, Campbell remained composed to fire top shelf just over a minute later. It took the Sharks just sixty two seconds to hit back as Gápa scored from the faceoff circle to Boyle’s left with support from left winger Steven Moore before Bowie drilled the puck low on 36:33. Nine seconds later, Whitley gained a power play when forward Liam Stenton received 2+10 for checking from behind. Unable to punish the Shark for his misdemeanour, the Warriors headed in on the wrong end of the 6-3 score line. Cale Tanaka looks on. Photo by IceHockeyMedia. Encouraged, the Sharks added a seventh to their tally just thirty five seconds into the final period, Gápa going it alone to surpass Boyle. Fighting back, Longstaff and Campbell worked to outwit McLaughlin whilst forward Callum Watson tried his luck from close range. Enhancing the tempo of their play, Ross and Edgar battled to weave a path through the Sharks’ defensive zone whilst Alternate Captain Sam Zajac and blue liner Harry Harley fired from the blue line in vain. A charging call against ‘D’ man Ross Connolly placed Whitley on the back foot but the Warriors worked hard to break down Solway’s attacking play and returned to full strength unscathed. 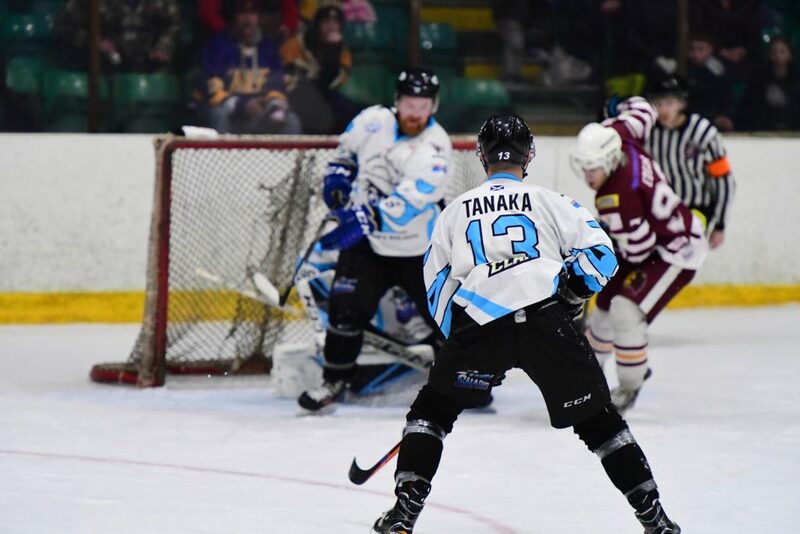 In spite of Whitley’s continued offensive work, it was not until a tripping penalty for Tanaka reduced the Sharks to four men that the Warriors made it 7-4, Longstaff wandering through Solway’s defence to tap the puck past McLaughlin on 53:50. The Sharks answered yet again, this time Tanaka feeding the puck to Bowie who completed his hat-trick to make it 8-4. Separated by just one goal on aggregate, the Warriors strove to restore their two-goal cushion, both Longstaff and Edgar working in front of McLaughlin’s net to find themselves just inches away from resigning Solway to their fate. Gaining a faceoff in their offensive zone, Solway called a timeout with sixty eight seconds remaining and pulled McLaughlin from his net in place of an additional skater. Seizing possession, Whitley fought for an empty net goal but Longstaff found himself unable to net against Solway’s resolute defence. The puck was then fired back into Whitley’s defensive zone, only for it to hit Zajac in the face to bring play to a short halt. Facing off again, the Warriors ran down the clock, ending the game with possession as the final buzzer called time on their 8-4 loss to the Sharks. Winning 10-9 on aggregate, Whitley Warriors now take on title winners Hull Pirates in next weekend’s semi-finals, playing at Hull Arena on Saturday evening before returning to Hillheads on Sunday for their home leg.